About Us - dm elektron S.p.A.
Technology in elecronics since 1982. dm elektron, the specialist in Original Design Manufacturing, is conceived to offer a complete and vertical service. Born in 1982 from the intuition of an entrepreneur, it involves about 300 employees committed to satisfy multiple needs through: dm elektron (Buja, Ud), specialized in electronic components assembly and complete product supply. Time after time, we developed a strategy evolving from sheer electronic components assembly to a long term customer relationship, improving our key knowledge in testing, industrialization and production thanks to highly innovative and reliable techniques. 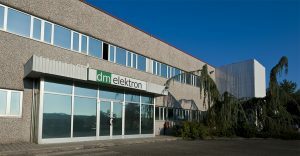 Dm elektron, facing the new pressing market requests, established a plant in Brasov (Romania), SC dm elektron, which guarantees customers a noticeable economic benefit while keeping high quality and security standards. Thanks to our R&D department, product development and industrialization are strictly integrated and completed within the company without intermediate steps, optimizing time, cost and quality. Moreover a prompt customer feedback, helps us finalizing the product accordingly to his needs, in addition our R&D expertise is tightly coupled with our industrial skills in start-up analysis First Article Inspection(F.A.I. ), a quality standard in dm elektron, is fundamental in the process of manufacturing and perfecting the final product. Much more than a partner, a structural part of the whole production process. dm elektron represents the ideal partner in electronics; with an offer ranging from PCB production to the complete product, dm elektron is also a 360 degrees supplier offering a complete service. The final technological control of each single product guarantees a successfull result. For dm elektron, all inclusive means working accurately on every stage of the value-chain: project engineering and developing, industrialization, material management, production and testing. Furthermore our R&D department assures a constant evolution of the product and an innovative market approach.